Confession - I'd never had Babka until this past Friday. Mark the occasion! April 1, 2016 - the day when yet another pastry was added to the ever-growing list of irresistible indulgences. This revelatory Chocolate incarnation was brought to me by a friend who will forever the guilty of introducing a new addiction. By the end of the following day, the entire Chocolate Babka was gone. Dancing the delicious line between Bread and Cake, Babka (also known as Baba or Kulich) is made from a highly-enriched, yeast-leavened dough. Polish in origin, the traditional Christian version is a Brioche-like Cake typically served at Easter. The more commonly recognized Jewish version is a rope-like loaf typically filled with Cinnamon & Sugar, Raisins, Nuts or Chocolate. I love yeast doughs. If given the choice between a sweet, yeast-leavened Bread and a traditional Cake, the Bread will always win. This distinct preference is why I was so disappointed back in culinary school when several yeast-leavened Cakes, including Pannetone and Kugelhopf, failed to wow. No such disappointment with the Chocolate Babka... enough Butter and Chocolate can solve almost any problem. For this recipe, I decided to follow the traditional Jewish format, which is made by rolling a sheet of dough covered with a filling into a log or roulade and then twisting it into a rope-like loaf. For the Babka Dough, I modified my recipe for Sweet Roll Dough, primarily by increasing the amount of Butter and Sugar to make it more like a Brioche. As for the filling, it's anyone's game, but Chocolate, Peanut Butter and Banana felt like a great combination in this case. Ends up, I was right! For some additional tips on baking Bread, be sure to check out these helpful illustrations! 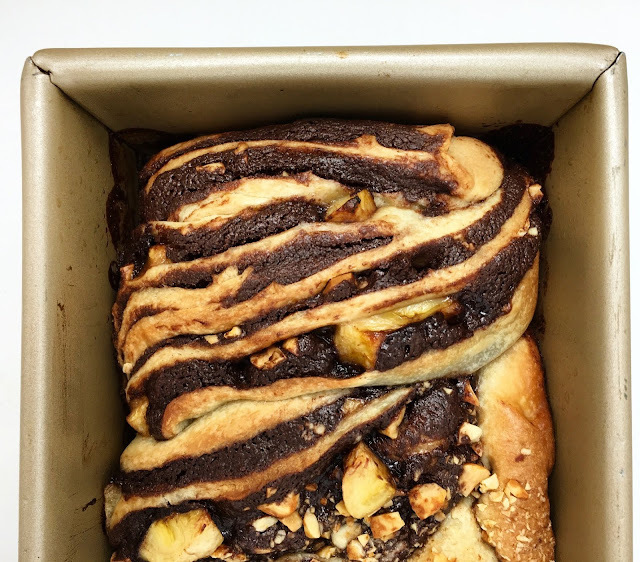 Just look at the ratio of Chocolate, Peanut Butter and Banana Filling to Babka Dough! Is there any question as to why this is a fantastic treat? Begin by making the Babka Dough, which is an enriched dough similar to Brioche with Sugar, Egg and lots of Butter included in the mix. First mix the Flour, Water, Eggs, Sugar, Salt and Yeast (i.e. everything except the Butter) in the bowl of an electric mixer fitted with a dough hook until the ingredients are well combined. Then knead the Babka Dough on medium speed until the gluten structure is well developed and it passes the "window test" (i.e. you can gently stretch a piece of the Babka Dough between your fingers and it does not tear but rather forms a "window" or thin pane). This can take up to 10 minutes. Only when the gluten structure is well-developed should you add the Butter, kneading the Babka Dough until the Butter is fully incorporated. If the Butter is added too early, the gluten structure may never develop as fats inhibit the formation of gluten. Once the Butter is fully incorporated and the gluten structure is well developed, transfer the Babka Dough to a well-oiled bowl or proofing container and let it rise in a warm place until doubled in size. 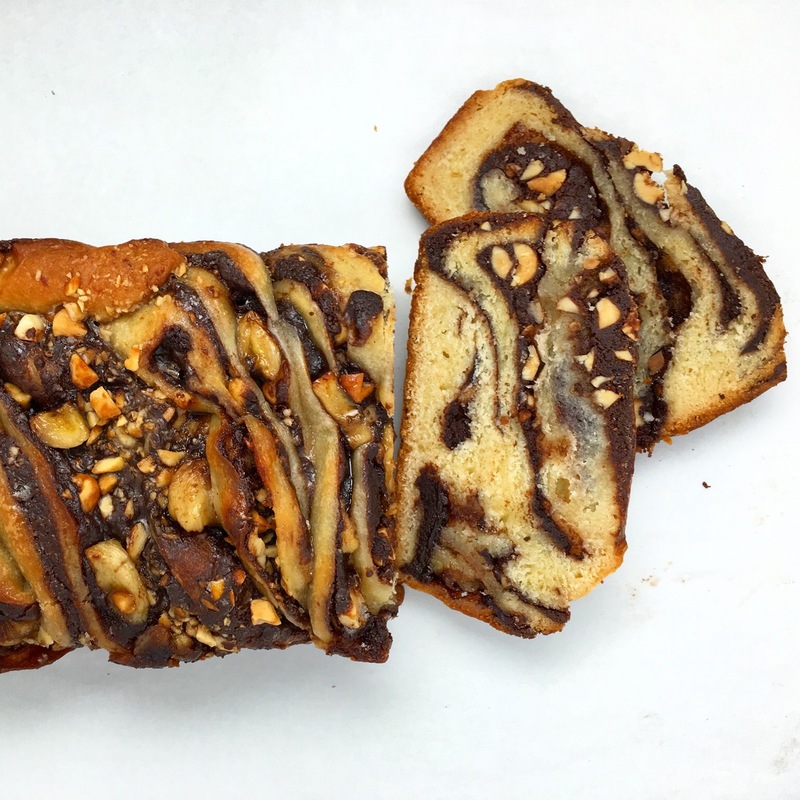 This process may take up to two hours, depending on the environment, given the enriched nature of the Babka Dough. Once the Babka Dough has proofed, it is best to let it rest and chill before continuing. The cold resting period will slow the fermentation process and develop flavor. "Punch" down the Babka Dough, degassing the Dough while flattening it into a large rectangle measuring about 9" x 13". Wrap the Babka Dough in plastic wrap and place it in the refrigerator to rest and chill for at least four hours, but ideally overnight. While the Babka Dough rests, you can prepare the Babka Filling. Cinnamon & Sugar or Chocolate are two of the most popular fillings, but anything is fair game. For this recipe, which makes one 9"x4" loaf, you'll want to prepare approximately 450g of Babka Filling (i.e. about one pound or two cups). 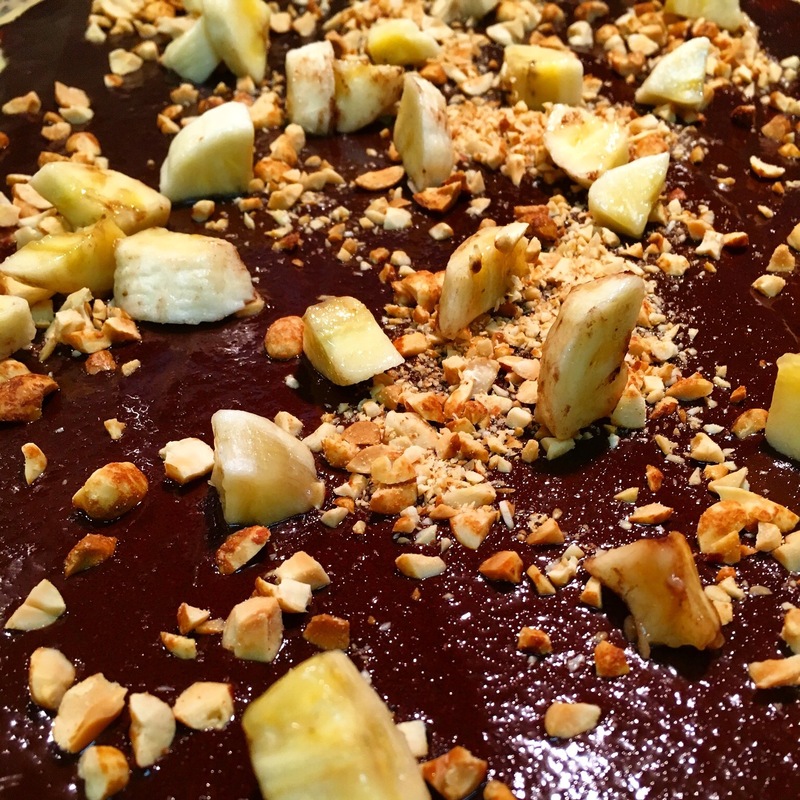 When I was testing this recipe, I was craving a Chocolate Peanut Butter and Banana combination. Trust me when I say you won't be disappointed. Start making the Babka Filling by gently melting the Butter and then stirring in the Sugar and Cocoa Powder. To prevent the Cocoa Powder from clumping (a frequent problem), combine it with the Sugar before adding it to the melted Butter. Once the Butter, Sugar and Cocoa Powder are well combined (the Sugar does not need to be dissolved), remove the mixture from the heat and stir in the finely chopped Chocolate, as if making a Ganache. Once the ingredients are mixed smooth, stir in the Peanut Butter until it is well combined. Set the Chocolate Peanut Butter Filling aside to cool before using. I also recommend adding finely chopped Roasted Peanuts to the filling for some texture, so chop the Peanuts in advance. As for the Banana, it should also be diced into 1/4" pieces; however, do not cut the Banana until right before you will use it to prevent discoloration through oxidation. 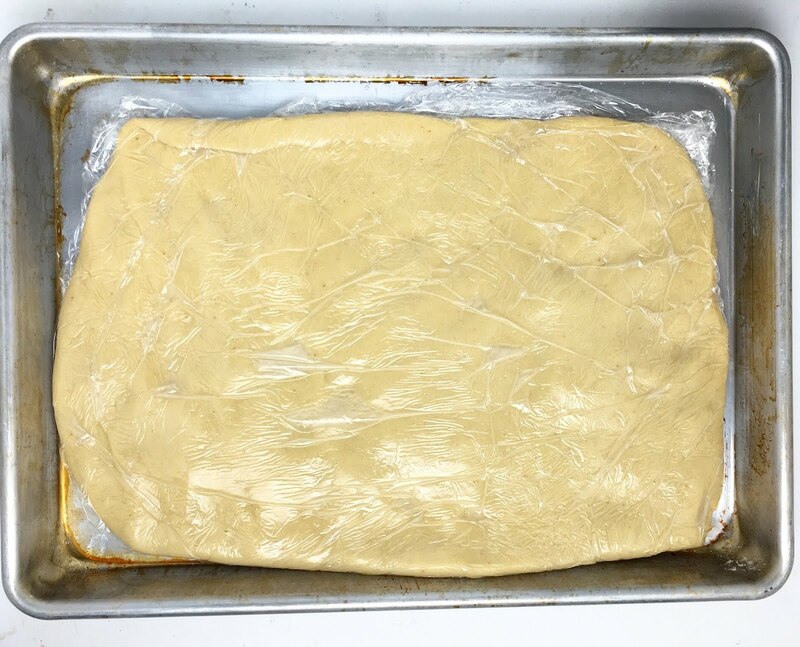 Once the Babka Dough is rested and chilled, roll it out on a lightly floured surface to a rectangle approximately 10" x 20". 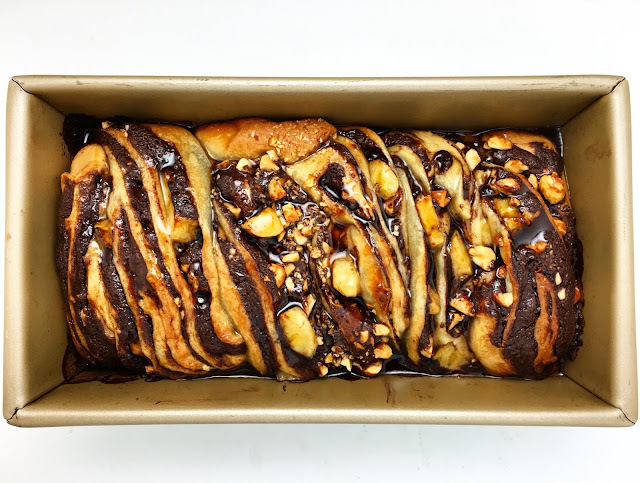 Spread the cooled Chocolate Peanut Butter filling in a smooth layer across the entire surface of the Babka Dough. 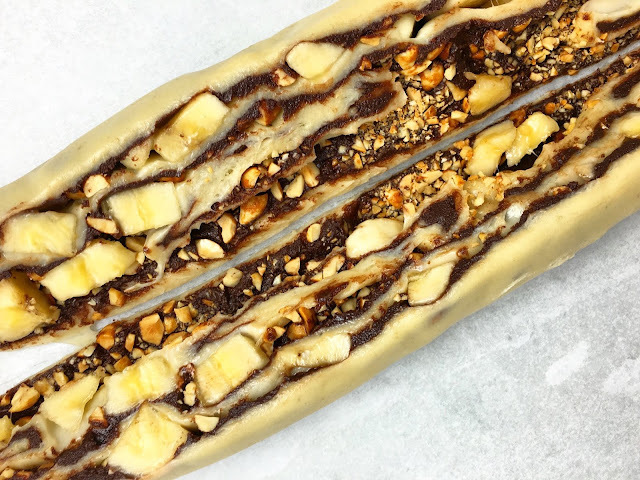 Sprinkle the chopped Roasted Peanuts and diced Bananas on top of the Babka Dough. With the long end facing you, tightly roll the Babka Dough to form a 20" log or roulade. If the Babka Dough has become somewhat soft, chill it for 15-30 minutes before forming the Babka Loaf. There are two ways to form the final Babka Loaf, both of which involve twisting the Babka Dough like a rope. The first method is to take the 20" log of Babka Dough, hold it in a "U" shape and then twist the two ends of the "U" twice to form a spiraled rope shape. This method keeps the filling sealed inside the Babka. The second method involves slicing the 20" log of Babka Dough in half, creating two 20" halves while also exposing the filling. The two 20" halves of Babka Dough are then twisted together. 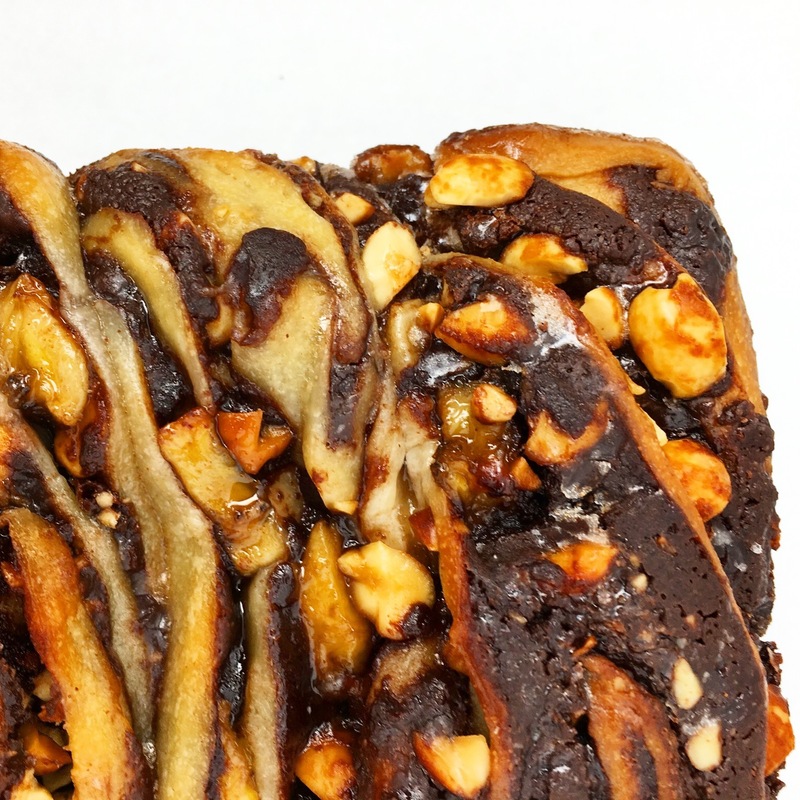 As the two halves are twisted together, the cut sides with the exposed Babka Filling are always facing up. I prefer the second method, as it results in a more visually impressive Babka. Once the Babka Dough is formed, place it in a well-oiled 9"x4" loaf pan, which helps the Babka retain its shape while baking. Loosely cover the loaf pan with a piece of plastic wrap and let the Babka proof until it has approximately doubled in size, which may take up to two hours. As the Babka proofs, preheat the oven to 375 degrees Fahrenheit (191 degrees Celsius). Bake the Babka for approximately 30-35 minutes, or until it reaches an internal temperature of 190 degrees Fahrenheit (88 degrees Celsius) or a cake tester inserted into the center of the loaf removes clean of Babka Dough (there will likely be melted Chocolate on the cake tester, so check closely for actual pieces of unbaked Babka Dough). As if the Babka were not a sweet enough indulgence already, the final touch is a coating of Simple Syrup that is applied as soon as the loaf is removed from the oven. The Simple Syrup adds a shiny finish, more sweetness (yay!) and helps seal in moisture, increasing the shelf life of the Babka. While the Babka is baking, make a Simple Syrup out of equal parts Water and Sugar. Bring the mixture to a boil and let it simmer for a few minutes until it just begins to thicken into a Syrup. As soon as the Babka is removed from the oven and while it is still hot, generously brush it with the Simple Syrup. Allow the Babka to cool in the loaf pan, but remove it while it is still somewhat warm. The Babka will fall apart if you try to remove it from the loaf pan while it is still hot. However, if the Babka is too cold, particularly if the Simple Syrup cools and thickens, it will be difficult to remove the Babka from the loaf pan. Like all baked goods, the Babka is best served on the day it is made. However, the Babka will keep in an airtight container at room temperature for several days. The Babka can be frozen for several months when wrapped well in plastic wrap. * If you do not have Fresh Yeast, you can use either Active Dry Yeast or Instant Yeast. For Active Dry Yeast, use 50% of the recipe weight (6g). For Instant Yeast, use 40% of the recipe weight (5g). 1. Combine the Water, Egg and Yeast in the bowl of an electric mixer fitted with a dough hook. Add the Flour, Sugar and Salt. Start mixing the ingredients on low speed until they are mostly combined. Increase the speed to medium and knead the Babka Dough until the gluten structure is well developed and it passes the "window test" (i.e. you can gently stretch a piece of the Babka Dough between your fingers and it does not tear but rather forms a "window" or thin pane). This process could take up to 10 minutes. 2. Add the Butter to the Babka Dough and continue kneading on medium speed until the Butter is fully incorporated and the Babka Dough is smooth - approximately 5 minutes. Chef's Note: Only when the gluten structure is well-developed should you add the Butter. If the Butter is added too early, the gluten structure may never develop as fats inhibit the formation of gluten. 3. Transfer the Babka Dough to a well-oiled bowl or proofing container. Cover the Babka Dough and let it proof until doubled in size - about 90-120 minutes. 4. "Punch" down the Babka Dough, degassing the Dough, while flattening it into a large rectangle measuring about 9" x 13". Wrap the Babka Dough in plastic wrap and place it in the refrigerator to rest and chill for at least four hours, but ideally overnight. 5. 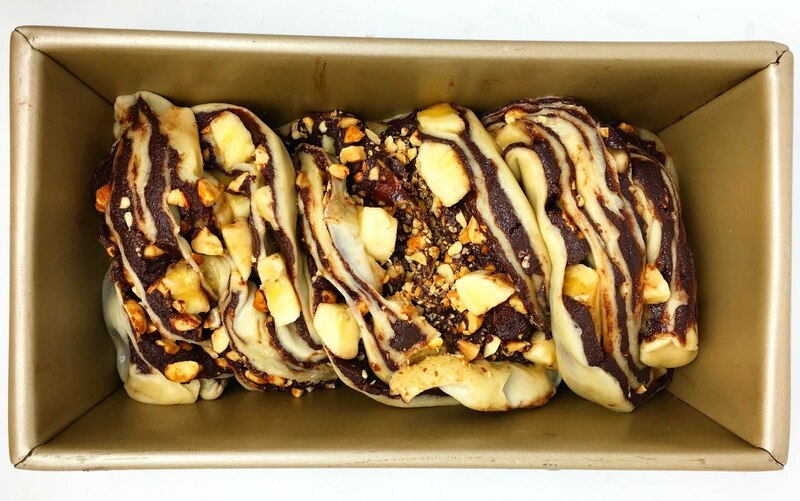 As the Babka Dough rests and chills, make the Chocolate Peanut Butter Filling. Gently melt the Butter in a pot over medium heat. As the Butter melts, combine the Sugar and Cocoa Powder in a small bowl. Once the Butter is fully melted, whisk in the Sugar and Cocoa Powder Mixture. Whisk the ingredients until they are well combined and there are no lumps of Cocoa Powder. Remove the pot from the heat and add the chopped Chocolate, stirring until it is fully-combined. Add the Peanut Butter and stir until it is fully combined. Set the Chocolate Peanut Butter Filling aside to cool. 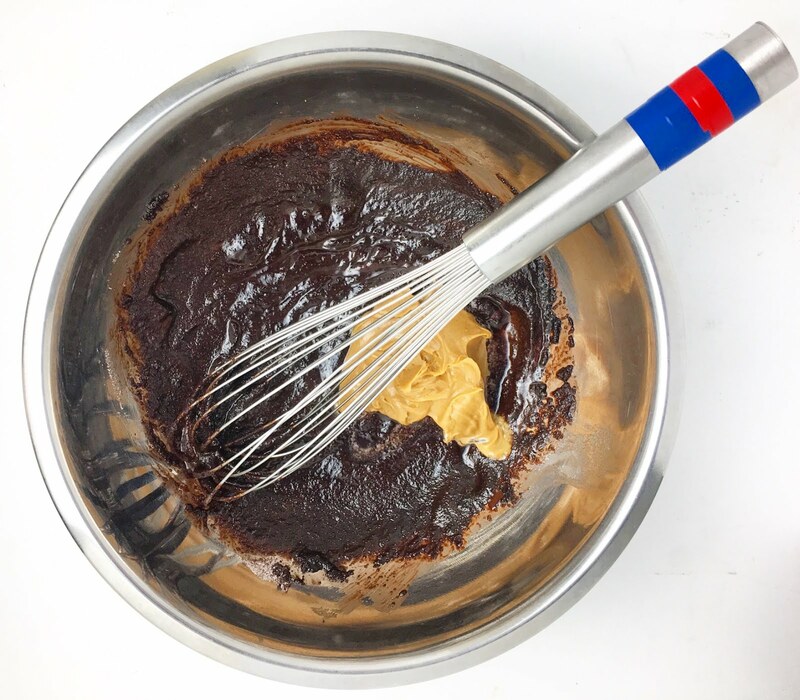 Chef's Note: Combining the Sugar and Cocoa Powder before adding them to the melted Butter will help prevent the Cocoa Powder from clumping. 6. Once the Babka Dough is rested and chilled, roll it out on a lightly floured surface to a rectangle approximately 10" x 20". 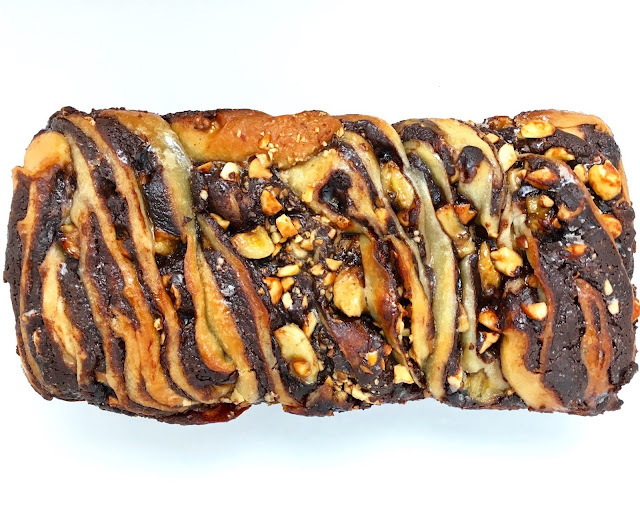 Spread the cooled Chocolate Peanut Butter Filling in a smooth layer across the entire surface of the Babka Dough. Sprinkle the chopped Roasted Peanuts and diced Bananas on top of the Babka Dough. 7. 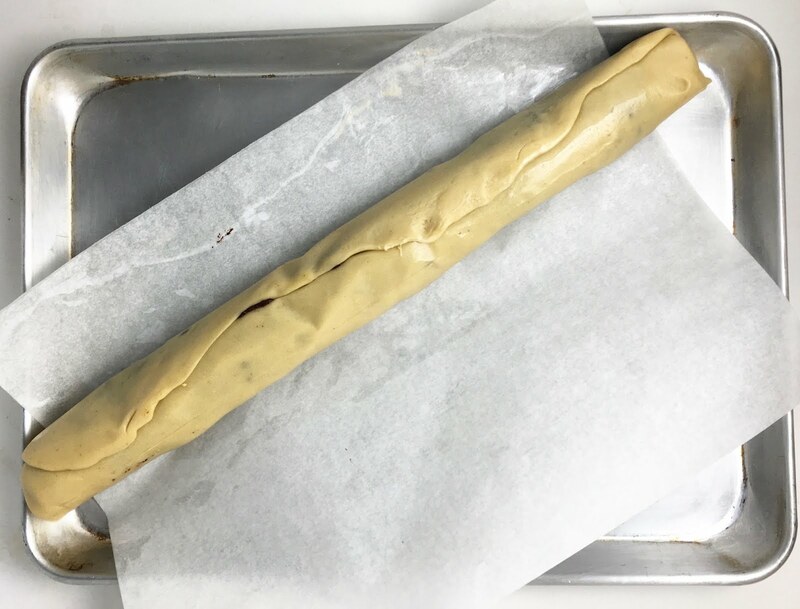 With the long end facing you, tightly roll the Babka Dough to form a 20" log or roulade. If the Babka Dough has become somewhat soft, chill it for 15-30 minutes before forming the Babka Loaf. 8. Slice the 20" log of Babka Dough in half lengthwise, creating two 20" halves while also exposing the filling. Twist the two 20" halves of Babka Dough together keeping the cut sides with the exposed filling facing up. Once the Babka Dough is twisted and formed into a loaf, place it in a well-oiled 9"x4" loaf pan. Chef's Note: Rather than slice the 20" log of Babka Dough in half lengthwise it can simply be held in a "U" shape and then twisted twice to form the loaf. This method keeps the filling unexposed. 9. Loosely cover the loaf pan with a piece of plastic wrap and let the Babka proof until it has approximately doubled in size, which may take up to two hours. As the Babka Dough rises, preheat the oven to 375 degrees Fahrenheit (191 degrees Celsius). 10. Bake the Babka for approximately 30-35 minutes, or until it reaches an internal temperature of 190 degrees Fahrenheit (88 degrees Celsius) or a cake tester inserted into the center of the loaf removes clean of Babka Dough (there will likely be melted Chocolate on the cake tester, so check closely for actual pieces of unbaked Babka Dough). 11. While the Babka is baking, make the Simple Syrup with the Water, Sugar and Cinnamon Bring the ingredients to a boil and let the mixture simmer for a few minutes until it just begins to thicken into a Syrup. As soon as the Babka is removed from the oven and while it is still hot, generously brush it with the Simple Syrup. 12. Allow the Babka to cool in the loaf pan for 15-20 minutes. The Babka will fall apart if you try to remove it from the loaf pan while it is still hot. However, if the Babka is too cold, particularly if the Simple Syrup cools and thickens, it will be difficult to remove the Babka from the loaf pan. - The Babka is best served on the day it is made. - Babka will keep in an airtight container at room temperature for several days. - Babka can be frozen for several months when wrapped well in plastic wrap. It's on the edge of being over-the-top indulgent, but I'm okay with that.